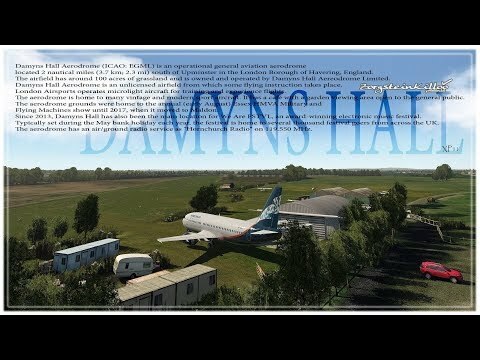 ORBX - Damyns Hall | Rating: 5! Damyns Hall Aerodrome (ICAO: EGML) is an operational general aviation aerodrome located 2 nautical miles (3.7 km; 2.3 mi) south of Upminster in the London Borough of Havering, England. The airfield has around 100 acres of grassland and is owned and operated by Damyns Hall Aereodrome Limited. Damyns Hall Aerodrome is an unlicensed airfield from which some flying instruction takes place. London Airsports operates microlight aircraft for training and experience flights. The aerodrome is home to many vintage and modern sport aircraft. It has a café with a garden viewing area open to the general public. The aerodrome grounds were home to the annual (early August) Essex HMVA Military and Flying Machines show until 2017, when it moved to Maldon. Since 2013, Damyns Hall has also been the main location for We Are FSTVL, an award-winning electronic music festival. Typically set during the May bank holiday each year, the festival is home to several thousand festival goers from across the UK. The aerodrome has an air/ground radio service as "Hornchurch Radio" on 119.550 MHz.